Addressing FAQ by Malaysians regarding Orang Asli customary land rights. Even among well-meaning Malaysians, many do not fully appreciate what are these rights are and understand why the Orang Asli can term this a right. “What makes them so special that they can demand customary land rights when the rest of us have to buy our land?” “Why should customary land rights be protected in these modern times?” These questions and more, answered here. Why should Orang Asli customary land rights be protected? What makes Orang Asli so special compared to other Malaysians that they demand land for “nothing”? These are two common questions that I have been asked by many fellow Malaysians during social occasions, particularly when they come to know that my research supports the recognition of Orang Asli customary land rights. The alarming frequency with which I am asked these questions by Malaysians whom I assume to be in the know about these matters prompt me to revisit these basic issues. And by Orang Asli, I mean those Indigenous communities who traditionally occupy Peninsular Malaysia and not those from Sabah and Sarawak. As food for thought, here are ten reasons why Orang Asli customary land rights should be protected. 1. Unlike other communities in Peninsular Malaysia, Orang Asli communities possess a special relationship with their customary lands. For others (including me), landed property is just a commodity of economic value. 2. Orang Asli are Indigenous. What do I mean by this? According to the former Chairperson-Rapporteur of the United Nations Working Group on Indigenous Peoples, the relevant factors in determining whether a particular group is “Indigenous” are (1) priority in time, with respect to the occupation and use of a specific territory; (2) the voluntary perpetuation of cultural distinctiveness, including social organisation, spiritual values, modes of production and laws and institutions; (3) self-identification, as well as recognition by other groups, or by state authorities, as a distinct collectivity and (4) past experience of subjugation, marginalization, dispossession, exclusion or discrimination. Orang Asli, who have persevered to maintain their way of life over the centuries, fulfill all these criteria. 5. Both Federal and State governments owe a fiduciary duty to Orang Asli, particularly in relation to their customary lands (Sagong bin Tasi v Selangor  2 MLJ 591, Selangor v Sagong bin Tasi  6 MLJ 289). This effectively puts Orang Asli in a unique position where the government must act honourably and for the benefit for Orang Asli when dealing with Orang Asli and their lands. Some 2000 Orang Asli gathered to voice their concerns over the proposed land policy that will amend the Aboriginal Peoples Act. 6. Orang Asli customary land rights have been recognised by Malaysian courts (Adong bin Kuwau v Johor  2 MLJ 158; Selangor v Sagong bin Tasi  6 MLJ 289). These rights do not need recognition by the government through legislation or any executive act. 7. The customary land rights mentioned in paragraph 6 are also protected by the constitutional guarantee to the right to property afforded to Malaysians under article 13 of the Federal Constitution. 8. The Malaysian courts have also held that the deprivation of Indigenous communities’ traditional livelihood and way of life amounts to the deprivation of the right to life under art 5(1) of the Federal Constitution (Ketua Pengarah Jabatan Alam Sekitar v Kajing Tubek  3 MLJ 23). 9. The United Nations Declaration on the Rights of Indigenous Peoples, to which Malaysia voted for twice, states that Indigenous peoples have the right to own, use, develop and control the lands and resources that they possess by reason of traditional ownership or other traditional occupation or use, as well as those which they have otherwise acquired (article 26 paragraph 2). In giving recognition and protection to these lands and resources, article 26 paragraph 3 states that such recognition shall be given with due respect to the customs, traditions and land tenure systems of the Indigenous persons concerned. This creates a genuine moral expectation that the government will pursue the achievement of the Declaration as a standard of achievement in the spirit of “partnership and mutual respect” (preambular paragraph 24). 10. The maintenance of Orang Asli customary lands is crucial to the development of traditional knowledge, a valuable tool for the development of, for example, the agricultural, forestry and medical science industries. The list goes on but I shall stop for now. Never assume that Orang Asli are not deserving of their customary lands. Law, human rights, justice and morality demand that we give Orang Asli due respect and recognition of their customary lands. LB: Yogeswaran Subramaniam, an Advocate & Solicitor and a member of Aliran, is pursuing a doctoral thesis in the reform of Orang Asli land rights at the Faculty of Law, University of New South Wales, Sydney. Lady Baba in Hulu Selangor: Are The Orang Asli and Orang Asal Really Free? May I know where did you get all of this information for your research? or can you email me your research for me to use it as my research references. Please? I would like to but Orang Asli in Peninsular especially at grassroot level feel that they are under siege at the moment in terms of their lands and territories. The proposed government land policy for the so-called issuance of individual land titles to each individual Orang Asli household is shocking and possibly unconstitutional. 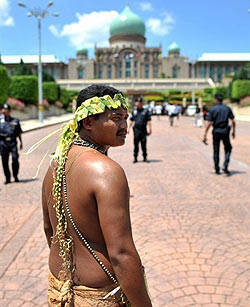 It may result in, amongst others, loss of customary lands and resources to Orang Asli. This is the Bar Council Committee on Orang Asli Rights's first priority. The proposed amendments to the Aboriginal Peoples Act 1954 that implements this policy,despite requested formally by the Bar Council, has yet to be furnished. Notwithstanding all this, the Federal Goverment will probably table the proposed amendment at Parliament's next sitting in October. Why aren't they listening to the Orang Asli people? I do not wish to go into possile answers to this rhetorical question. Stop running their lives and listen to the rakyat Orang Asli as opposed to a few elites whom the government claims to represent the views of the community. Help the Orang Asli in a proper democratic way, BN!!!! I bought a bar of the handmade Kaoprise soap that supports Mon women refugees – quality stuff, worth every buck. Natives of Sabah and Sarawak were excluded from this article as they possess additional rights under particular Sabahan and Sarawakian laws and are positioned somewhat differently under the Constitution. Perhaps I should write a consolidated piece the next time around! I may have missed something. Is there any particular reason why the Natives from Sabah and Sarawak excluded? Dear Yoges, Thanks for the excellent piece on a very pertinent issue regarding Orang Asli entitlement to land. Regrettably, a lot of us are unable to understand and nurture our relationship with a very important segment of our society. I hope in time you can suggest to us some ways in which urban based folk like me can have a meaningful relationship with Orang Asli (as opposed to merely fighting for their rights, etc.). Thanks!